Ogawa World, a global leader in health and wellness products, has done it again, releasing two exciting new massage chairs to the US market. Ogawa’s new massage chairs tout innovative functionality that change the way robotic massage performs and makes the massage robots more effective and humanlike than ever before. With the goal of bringing wellness to the world, Ogawa introduces their new line of massage chairs, the Ogawa Refresh and the Ogawa Active SuperTrac. As in its name, the Ogawa Refresh aims to “refresh” and rejuvenate the body and mind of the user with thorough full body massage. The Refresh features the exclusive Smart Curve, massage roller track, allowing the rollers to place emphasis on the important muscles and vertebrae along the cervical curve of the spine in the neck region. The Smart Track provides more precise massage to the neck, shoulders and lumbar area, alleviating pain and discomfort where users need it most. Strategically placed air chambers for circulation and muscle tension relief inflate to cushion and adjust the body for comfortable massage. Zero Gravity recline makes the body feel light as air eliminating weight from the spine as the user enjoys soothing heat during the chairs various massage modalities. Ogawa excites in the idea of bringing new concepts to life in their massage products. When searching for a massage chair, customers are posed with important questions, glute massage or not? Zero Gravity or not? Full body recline or not? The designers of the Ogawa Active SuperTrac took problems with popular massage chairs and turned them into one amazing massage solution: extended roller massage for the head, neck, back, and under the seat for the glutes. The SuperTrac extended massage roller track is adjustable, meaning that users choose based on their massage needs, if they want upper body massage only, or if they need lower back and glute massage as well. Users have the choice of 2 relaxing Zero Gravity positions, the comfort of the fully reclined “bed” position, and every position in between. The relaxation of healing heated massage and the luxurious foot massage round out a truly brilliant new massage chair. “Ogawa has always been focused on innovation in health and wellness products. We’re excited to introduce the world’s first SuperTrac. It’s one of the greatest advancements in massage chairs today”, says Mark Holmes (COO) of Ogawa. 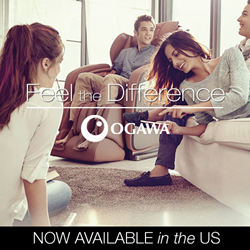 In addition to their new massage chairs, Ogawa has introduced 2 new massagers; a foot massager and foot and leg massager. The Ogawa Foot Therapy Plus is a reflexology foot massager that provides deep kneading roller massage with acupressure nodes to release tension throughout the body. The Foot Therapy Plus uses 3 different massage programs, 3 pressure settings, and heat to relieve even the most tired soles. The Ogawa OmKnee foot and knee massager uses a unique Flip-Over function that allows the user to choose foot and calf massage or foot and knee at any time. 7 therapeutic massage modes and thermotherapy make the OmKnee a perfect relaxation tool for everyone. To learn more about Ogawa’s innovative new line of products, visit OgawaWorldUSA.com.